Oxfam leads the consortium called Poletika, with other ten organizations and civil society movements. Poletika was born in 2015 as a political advocacy instrument. Its founders wanted to put pressure on political parties for them to include in their manifestos the demands of the consortium. When the elections came, Poletika started a monitoring phase. They checked if those promises made by political parties during the previous months were in fact being included in their manifestos. The task of monitoring all the public statements of so many politicians through different channels and during such a long period was titanic. And so they came out with an original solution: Letting their affiliates and followers help them. A crowd sourcing strategy, similar to the one used by Wikipedia. This second phase of Poletika was a huge success in terms of participation and impact. The brand appeared several times on national TV and some politicians even replied to their claims in social networks and offline events. But the electoral period came to an end and Poletika had to reinvent itself. It was time to put pressure on elected officials to make sure all those commitments that took so much effort did not come to nothing. That was the moment when they came to us looking for ideas to launch their new website and digital strategy for this third phase of the project. First our consultants collected aggregated data about the usage of Poletika’s previous website and social networks. Thanks to our data analysts we discovered some weaknesses, like frictions in the user journey, confusing call-to-actions and the absence of a user retention strategy. Only with that information we could have made a solid proposal. But after meeting the founders of Poletika we realized about the great potential and creativity of those people who had led successfully such an ambitious digital project without the help of online communication experts. And therefore we decided to help them elaborate a proposal by themselves through an inception session. Inception sessions are workshops that normally last for several days. In those workshops we normally gather people with different levels within the organization and guide them through a creative process to identify the weaknesses in their website (or their digital strategy) and generate ideas to solve them. Then we apply selection techniques to discard the great majority of those ideas and stick only to those that really add value in line with our client’s strategic goals. 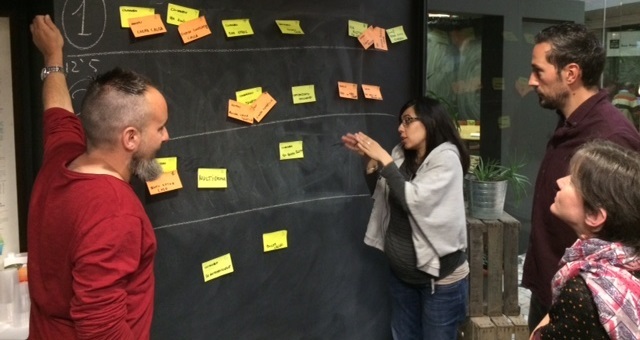 Then one of our developers transforms those ideas into the group of development tasks necessary to implement them. She assigns an economic value to each of the tasks – hours of effort or points. And finally we distribute a limited number of points among the attendees and we let them discuss about how to invest them: Which tasks do they want to get first? Thereby we get clients to prioritise their web development needs correctly even if they don’t have the needed technical knowledge. Oddly enough, some of the conclusions they reached were foreseeable, like the need to reduce frictions in the user journey. But some other, mainly those related to the way they worked among themselves, we could have never imagined. Today Poletika continues gathering citizen support for their political advocacy campaigns and giving them visibility. Now their website and their digital strategy is in line with their goals and with the resources they have.